Very potent protection can be provided by amulets. These are charms that have been marked with a symbol to indicate the power they contain. This could be a protective god or goddess, or a sign of the zodiac or a planet that you feel has the power you need. Alternatively, you might simply write the name of the person to be protected and surround it with a circle to keep out ill-wishing. 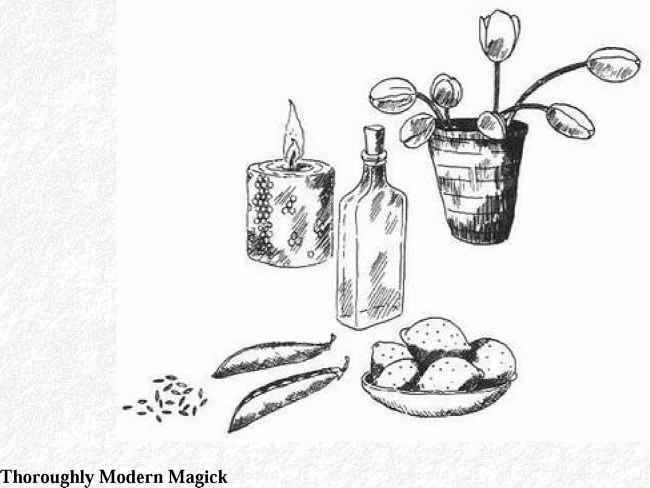 You can make an amulet in any shape you wish, out of candle-wax or clay, or you could use wooden discs, cut from an old broom handle. The symbols may be engraved, using a sharp knife, or painted on. You can add decorations if you wish. Amulets may be carried in your pocket, or you could drill a hole and thread a ribbon through an amulet and hang it around your neck. They may also be placed in a house to offer protection against danger and illness. Protective crystals (see page 153) also make good amulets and empowered herbs of protection (see Chapter 6), carried in a purse or bag are potent in the same way. Traditionally, the week before the midsummer solstice is the time for making protective amulets, so that they can be passed through flame or held up to the Sun on the solstice day at noon.